In analogy to the historical scaling of silicon microelectronics governed by Moore's law, miniaturization and large-scale integration of photonic components on a silicon platform represents an eternal melody for applications of integrated photonics, such as high performance computing and optical communications. 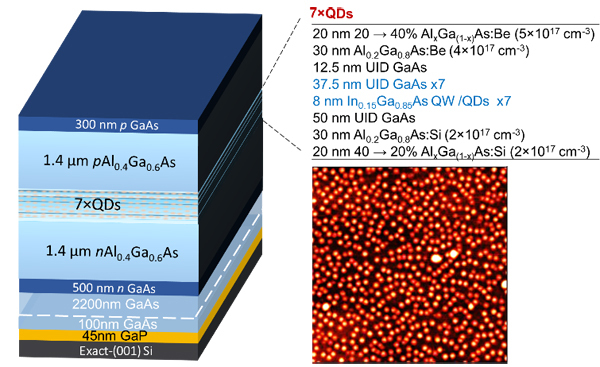 By utilizing the in-plane carrier confinement properties of quantum dots (QDs) to combat heteroepitaxial defects, the performance of monolithically grown lasers on Si is improving rapidly. To further achieve the goal of attojoule optoelectronics for on-chip interconnects, small-footprint micro-ring lasers, with their inherent single wavelength operation, are particularly attractive. 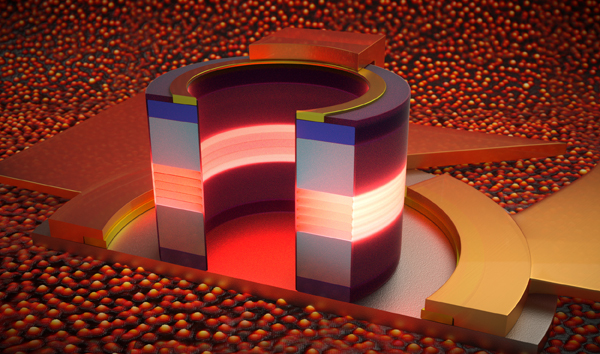 Recently, the Optoelectronics Research Group led by Prof. John Bowers from the University of California, Santa Barbra demonstrated direct modulation of electrically-driven quantum dot micro-ring lasers epitaxially grown on a CMOS compatible Si substrate. The lasers leverage a QD gain region, whose discrete nature reduces the lasers' sensitivity to threading dislocations and sidewall recombination. Together with an optimized III-V/Si growth template to minimize the density of dislocations, exceptional lasing performance was achieved even relative to lattice-matched material systems: laser emission near 1.3 µm with few unique modes in spectrally distant locations that enable eﬀectively single-mode operation, high temperature stability with T	0~103 K, low threshold of 3 mA, and a 3 dB bandwidth of 6.5 GHz. Related results are published in Photonics Research, Vol. 6, Issue 8, 2018 (Y. Wan et al., Directly modulated quantum dot lasers on silicon with a milliampere threshold and high temperature stability). Prof. John Bowers, Deputy Chief Executive Officer of AIM Photonics, believes that this work represents a major step towards using III–V/Si epitaxy to form efficient, easily manufacturable on-chip silicon light sources having dense integration and low power consumption. Dr. Yating Wan, et al. are continuing work to integrate coupled waveguides for efficient extraction/coupling of the lasing light. In the meantime, a number of device designs for distributed feed back (DFB) lasers and tunable lasers, have been completed for integration on the same material platform.